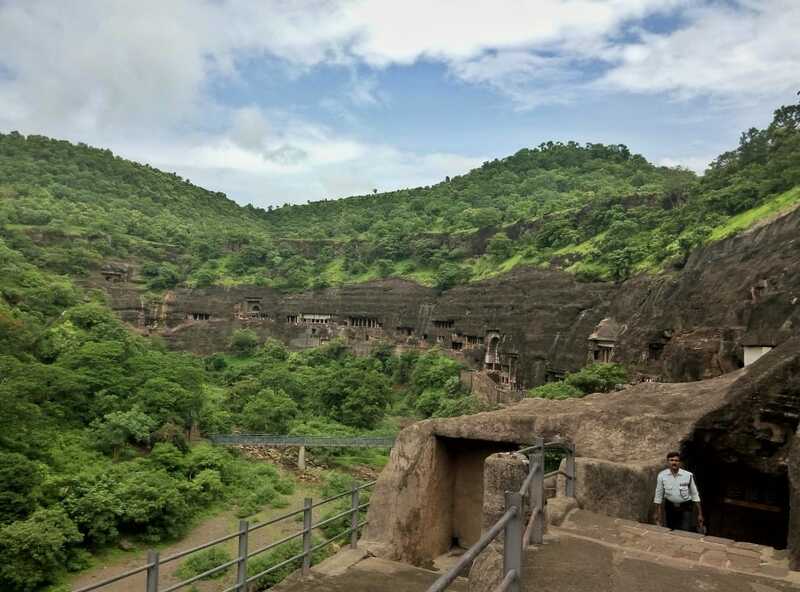 Unique feature of Indian cultural heritage is rock-cut chambers – cave temples and monasteries. 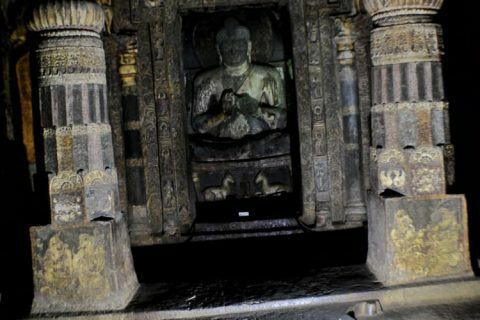 In total there are more than 1,500 such temples spread out throughout the country containing incomprehensible amount of art values – paintings, sculptures, inscriptions. 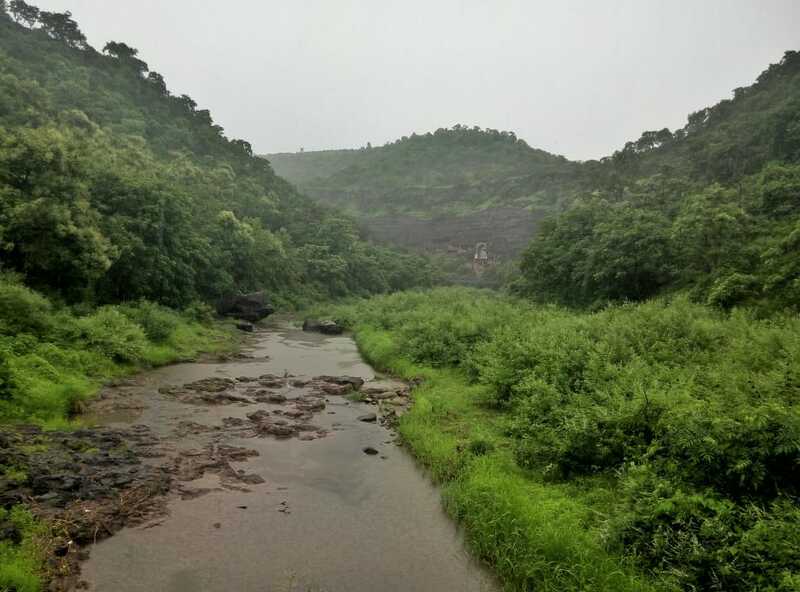 Archaeological and historical investigations of this extremely rich heritage has taken many exciting years of numerous scientists but there still is almost endless work to be done. 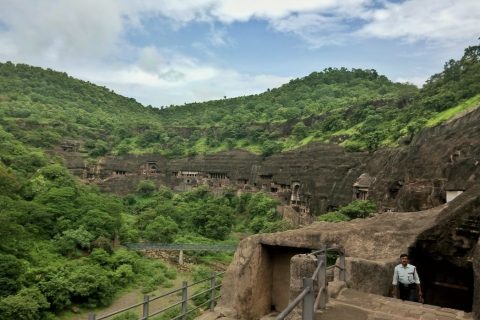 One of the best known and most impressive groups of cave temples is Ajanta Caves – these impressive structures form a popular tourist destination. 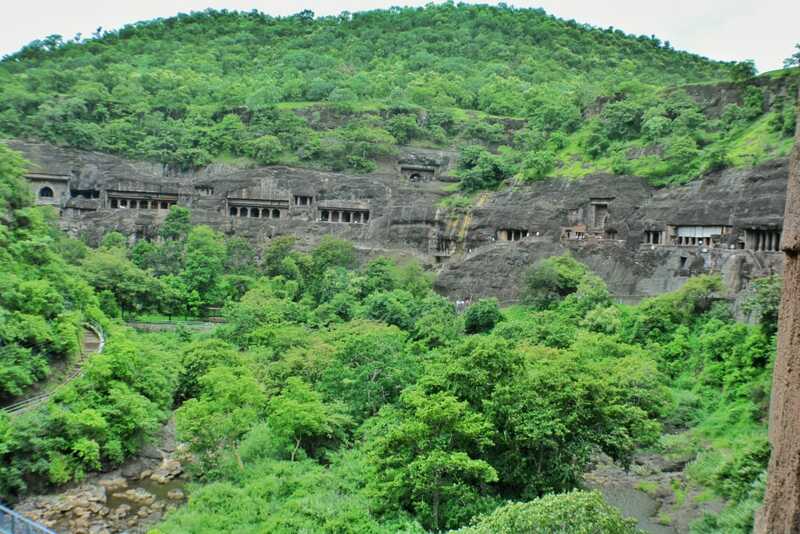 These caves contain some of the richest collections of ancient art in region. Ajanta art inspired numerous artists of the late 19th – early 20th centuries, many people were essentially obsessed with copying Ajanta paintings, there have been written numerous books about this phenomenal achievement of humanity. Ajanta Caves served as an extremely important religious centre of Central Indian empires and, although located in hard-to access canyon, mirrored the political and social development of Central India. 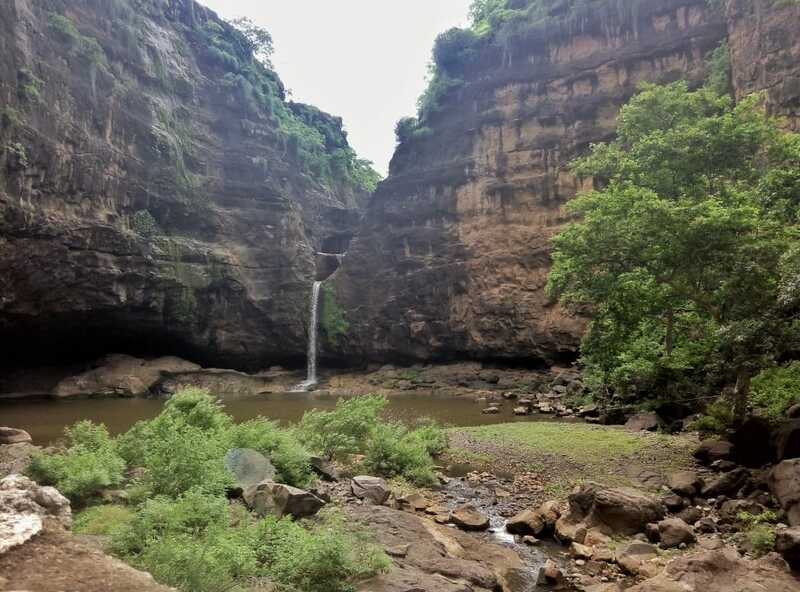 First Buddhist caves in the vertical walls of the 75 metres deep (vertical wall is not that high, this height includes talus) Waghora River canyon were created more than 2,000 years ago. 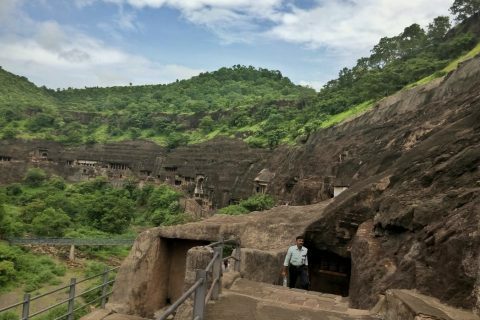 During the Sātavāhana dynasty in the 2nd – 1st century BC early Buddhist monks did something what is hard to do even today – they managed to carve huge halls in the hard basalt rock of Deccan trap. 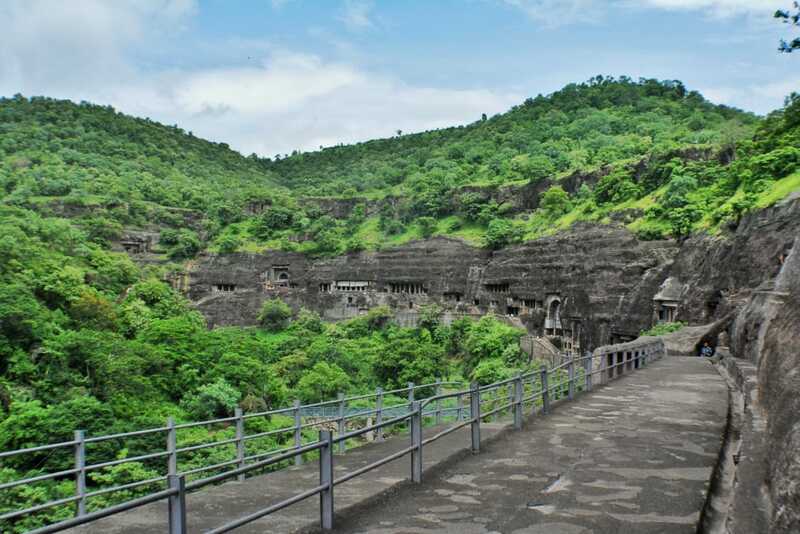 Zenith of Ajanta though came in 460 – 480 AD, during Vakataka dynasty. Then Indian stonecutters had to master art which was almost forgotten. 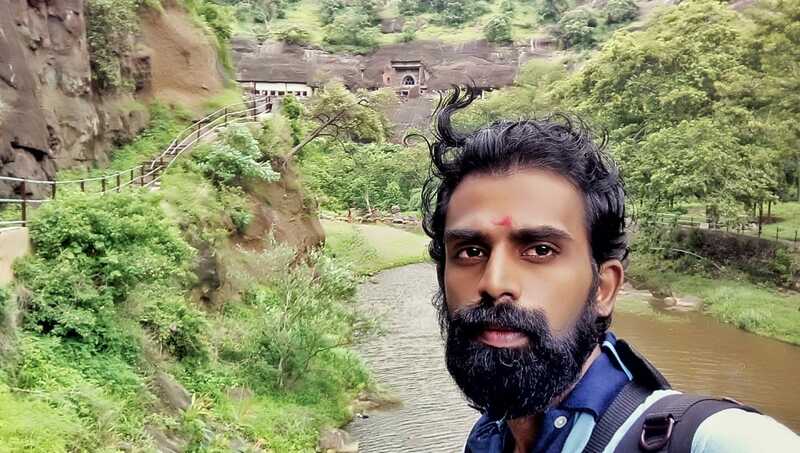 For three centuries there were not created any cave temples in India and thus numerous people had to learn unique skills – to learn it in hard way, by doing. 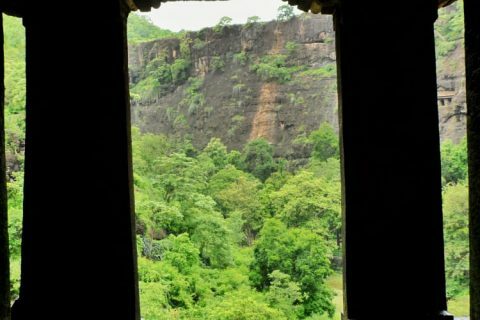 Cave chambers were not just rough hollows – stonecutters made whole interiors with columns, doorways, arched windows – everything was made by hollowing the solid rock as if it was cheese. Even more – up to 6 metres high columns, walls, ceilings were decorated with amazing bas-reliefs, often the flat walls were covered with beautiful, colourful murals. 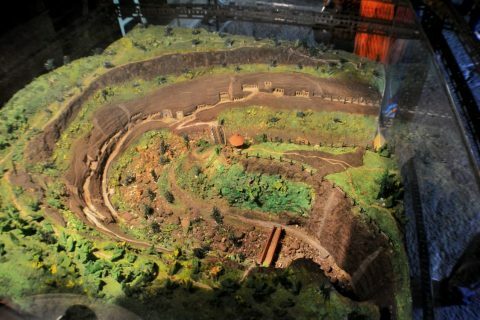 Layout was marked on cliff face and the works started from above and went downwards until reaching the floor level. Basic work was done with sharp pick-axes, then the cliff face was levelled by hammer and chisel. This hard work was done with a great precision. Largest spaces without supports reach 21 x 15 metres – slightly smaller than basketball field. 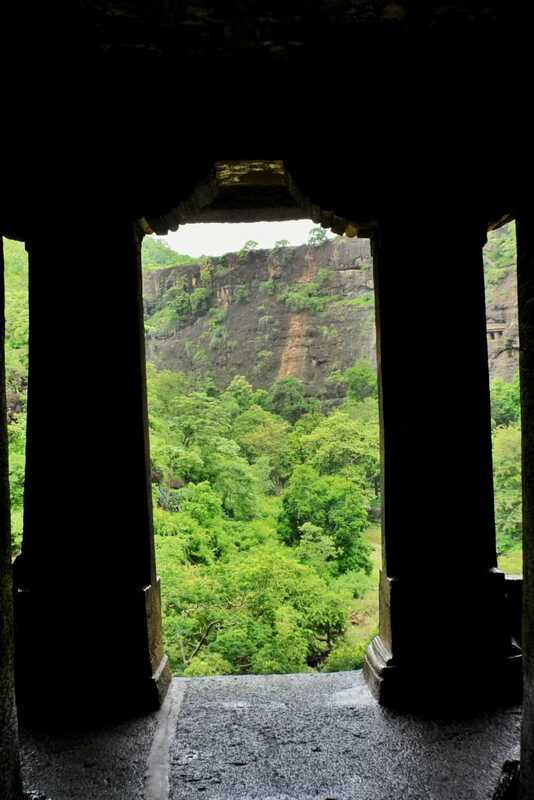 But, if counting the supports, the halls are significantly larger – ancient stonecutters had quite good knowledge of structural engineering and with great skill planned the use of lintels and columns to create durable constructions. 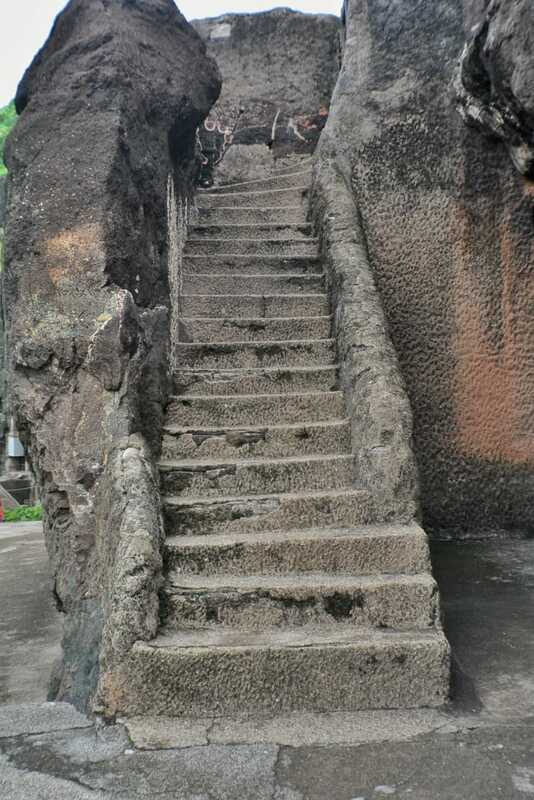 Originally caves were accessible by separate stairways from below, from the edge of water. Nowadays access is much simpler – along the terrace there leads a road with nearly direct access to most cave temples. 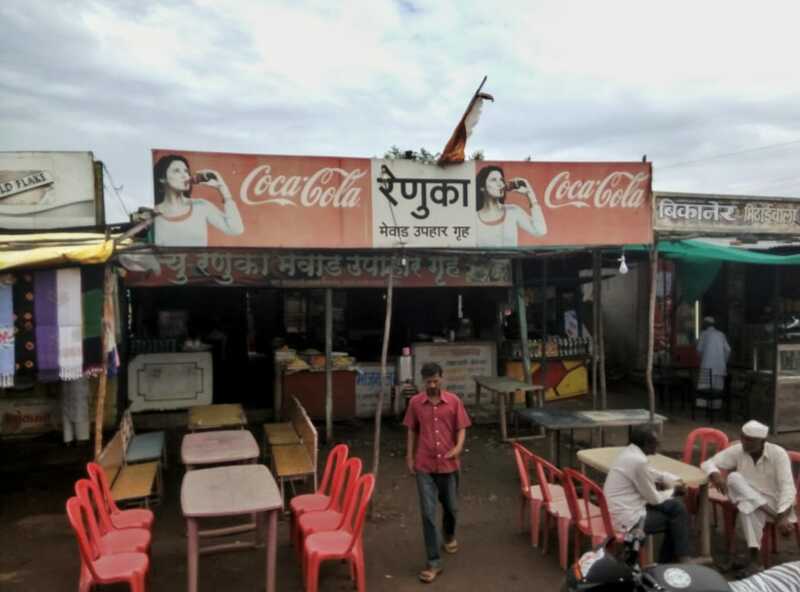 Caves No. 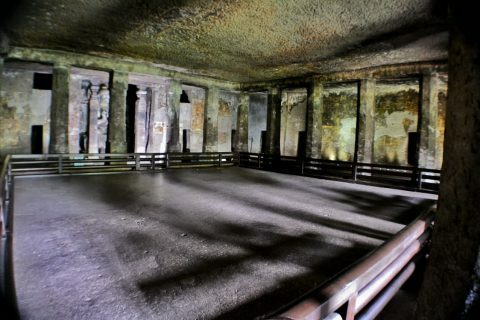 9, 10, 19, 26 are ancient sanctuaries – chaitya-grihas. Other caves though are created as monasteries – viharas. 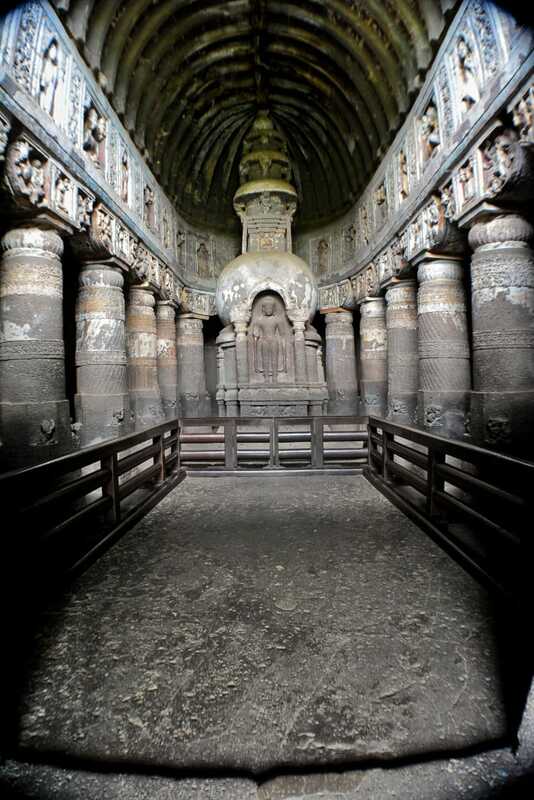 Several chaitya-grihas are the most ancient monuments in Ajanta, for most part created in the 2nd – 1st century BC. They are characterised by horse-shoe shaped bay above the doorway and central nave which is divided from side aisles with colonnade. 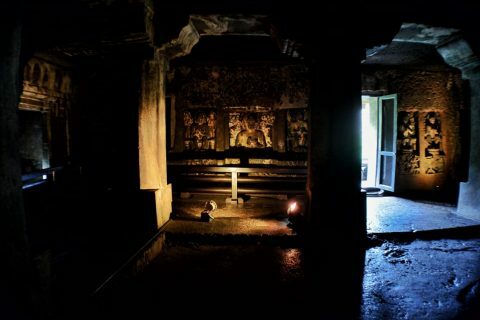 Side aisles open in the apsis where was located stupa – reliquary. 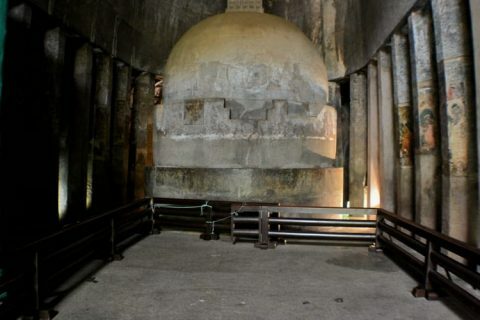 It was possible to go behind stupa – rear wall in the plan is semicircular. 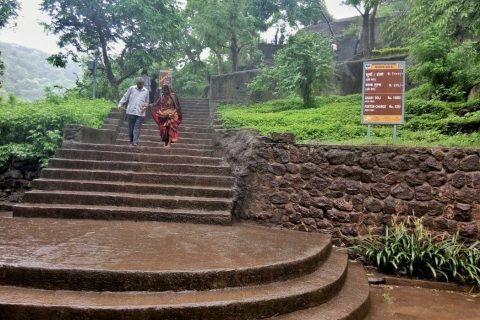 Thus in several aspects these ancient temples are similar to contemporary Christian churches. Here, as it is seen in many ancient stone structures around the world, architecture is modelled after wooden architecture. 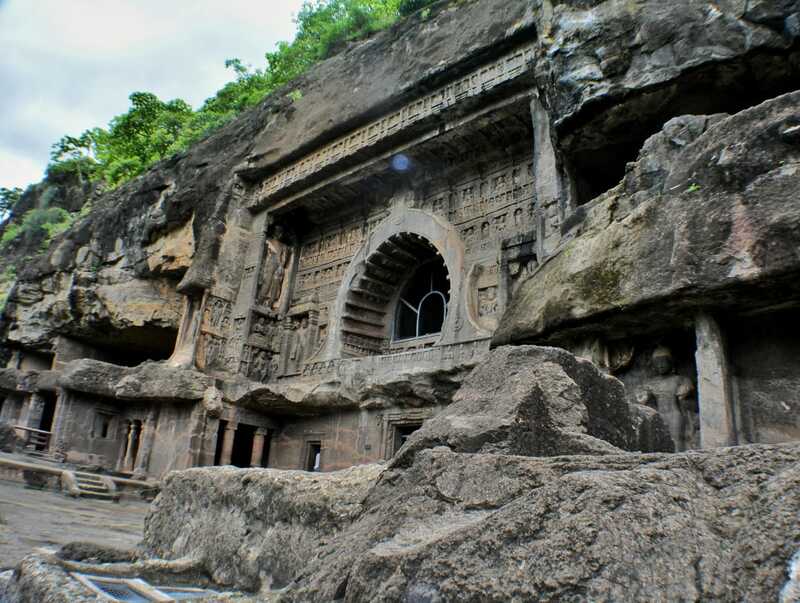 Earlier structures were modelled after the simpler Hinayana cave temples. 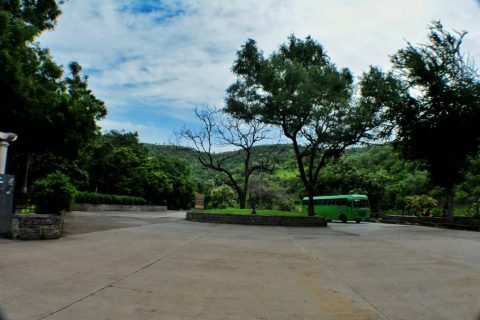 20 viharas are newer – built during the years of ambitious patronage of Vakataka kings. Concept of construction of Buddhist temples underwent revolution sometimes around 460 – 470 AD and as a result the initially planned comparatively simple dormitories turned out to be complex, sophisticated religious complexes. They included shrine at the far end of structure with a focus on large Buddha statue. 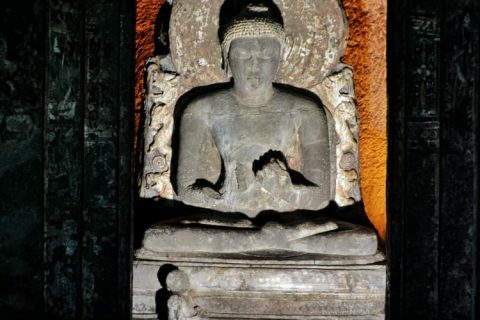 Sculpting Buddha was allowed comparatively recently and artists used image of Buddha to show him present among the monks. 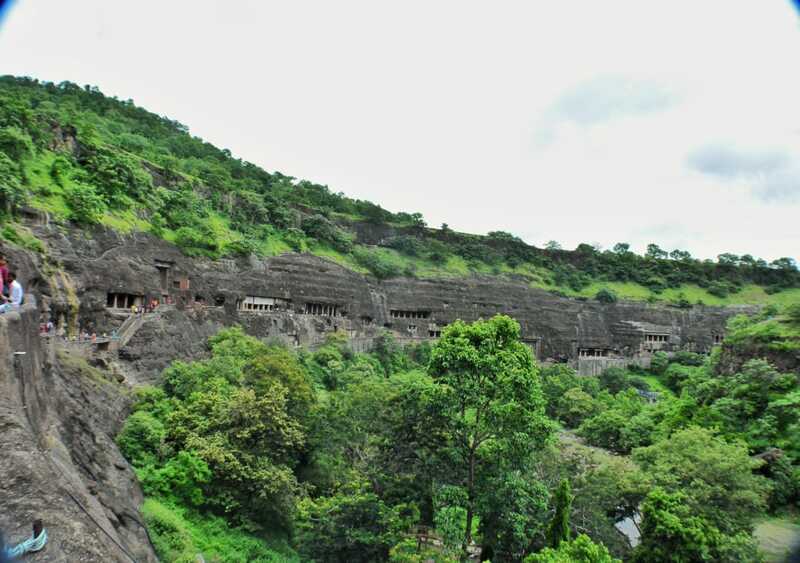 It seems that simultaneous building of 20 viharas, each patroned by separate influential authority, rised rivalry among architects and artists, thus adding much splendour to Ajanta Caves. 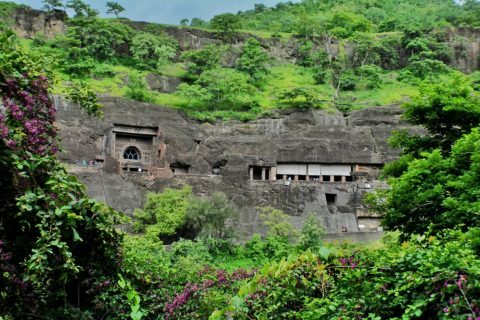 Viharas of Ajanta belong to most ornate and rich structures known from ancient times with numerous statues on facades and inside the structures. 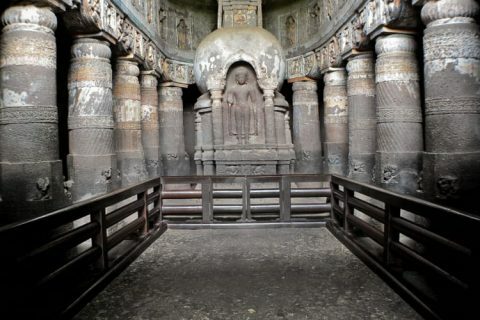 In many aspects the art in Ajanta symbolises the golden age of ancient Indian culture, especially during the reign of emperor Harishena of Vakataka dynasty. 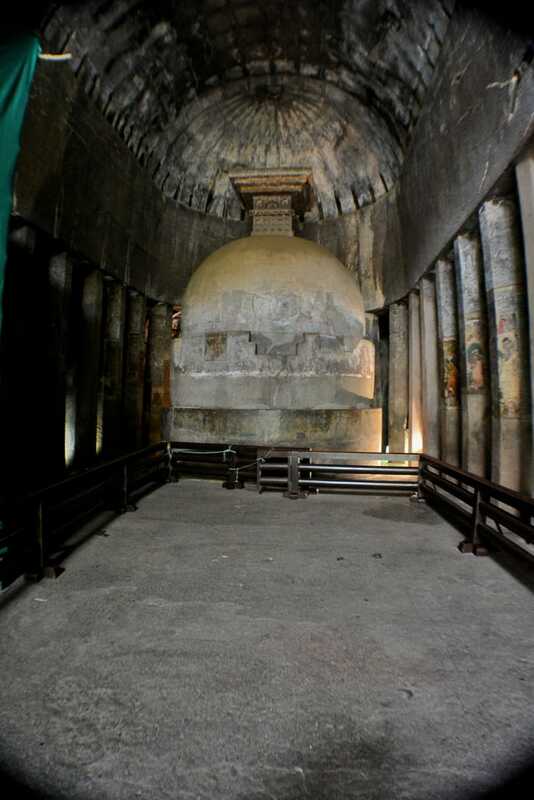 Several chambers of Ajanta contain some of the best paintings in Buddhist religious art. Ajanta contains also the oldest known Indian paintings from the 2nd century BC. 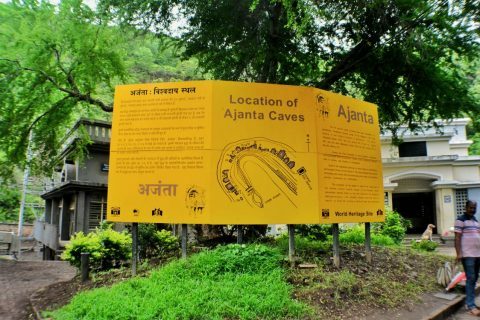 Paintings of Ajanta are frescoes. 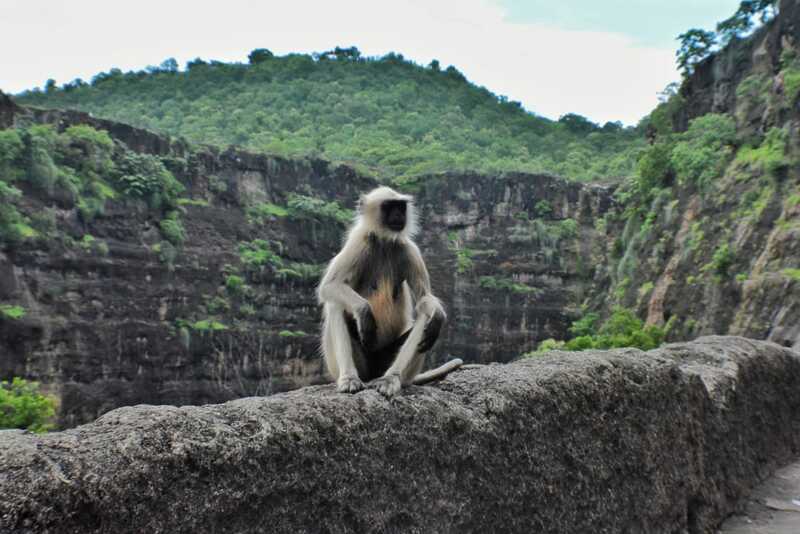 In Ajanta murals were made in a specific way, involving several stages of work. First the surface was prepared – stone surface was chiseled to make rough surface holding the plaster. Then there was laid plaster consisting of clay, lime, hay and dung. Paintings were made while the plaster was wet and colors were made of minerals and plants. This technique allowed to make paintings which preserved much of their original glory even after 1,500 years of abandonment in tropical climate. 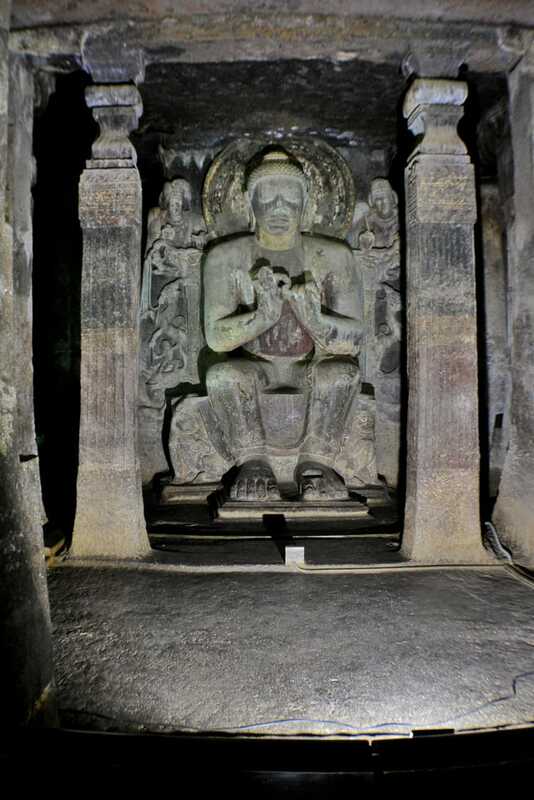 Plastering was done by really skillful artisans – even some of sculptures were plastered to get effect of smoothness. Unusual shine was achieved by adding powdered conches and seashells – such polished plaster has glassy surface. Paintings of women in Ajanta are world-renowned – women in these drawings are beautiful. How else? Many of woman paintings and sculptures depict such mythical beings as yakshas, nagas, vrikshikas, river goddesses Ganga and Yamuna. Supernatural beauty is part of the essence of such beings. Time is relentless – some paintings miraculously have survived but many things have changed. 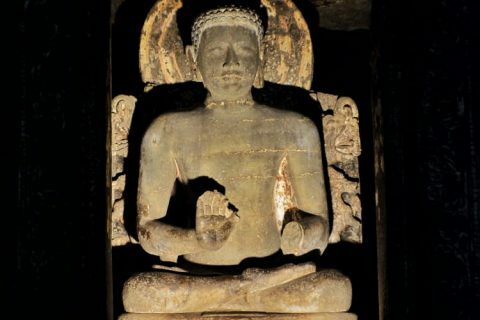 Statues of Buddha nowadays have rugged, uncolored surface – but many centuries ago they most likely were smooth and covered with bright colors. 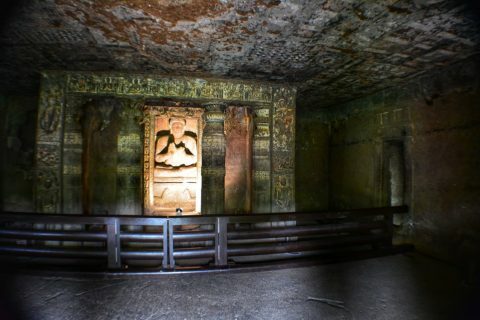 Sometimes it is mentioned that the painting technique in Ajanta is not fresco, it is mural. This is somewhat confusing announcement – as if somebody would say that herring is not a herring but a fish. Fresco is characterised by application of paint on a wet plaster – thus ensuring long life of colors. 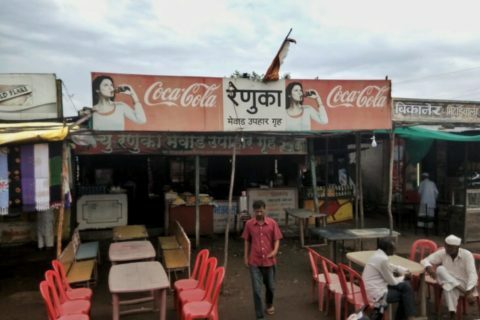 Exactly this was made in Ajanta. And finally – any fresco is mural. Mural simply is painting on a wall, ceiling or similar large surface. 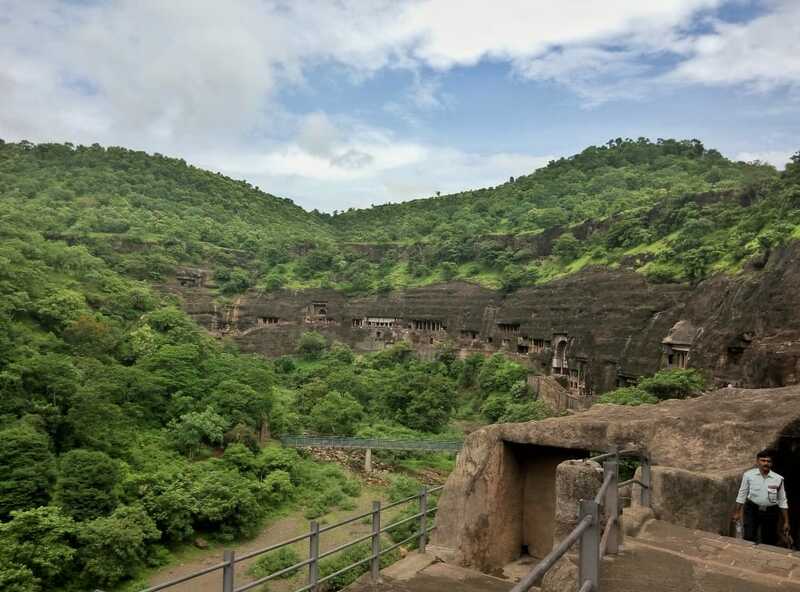 With the grandiose fall of Vakataka empire sometimes around 480 AD Ajanta Caves were abandoned – within few months after the death of Harishena all the influential patrons of Ajanta Caves fled and Buddhist monasteries lost any support. Some of paintings seem to be abandoned in hurry – just few hours were needed to make them ready, but some sudden events made further work impossible or useless. 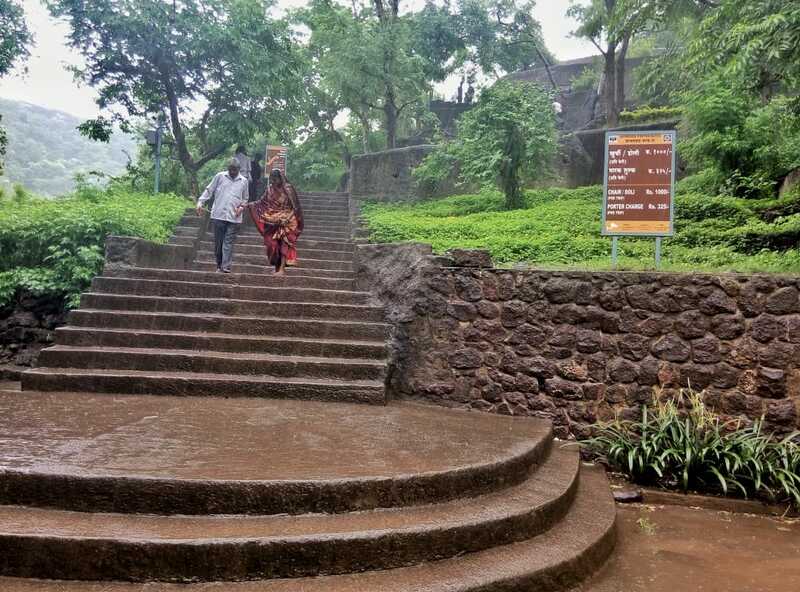 The year of abandonment still is challenged by some scientists – some consider that temples were inhabited up to the 7th century AD, there is report from Chinese pilgrim Hieun Tsang from the 7th century – he saw these monasteries full with life. 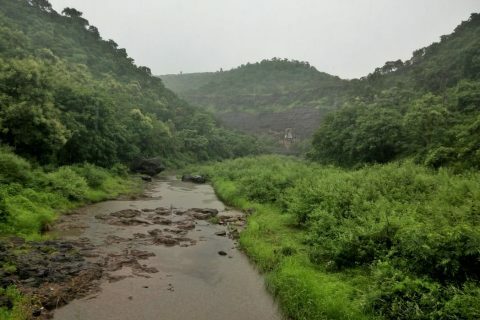 Forbidding canyon of Waghora River soon grew over with dense jungle. 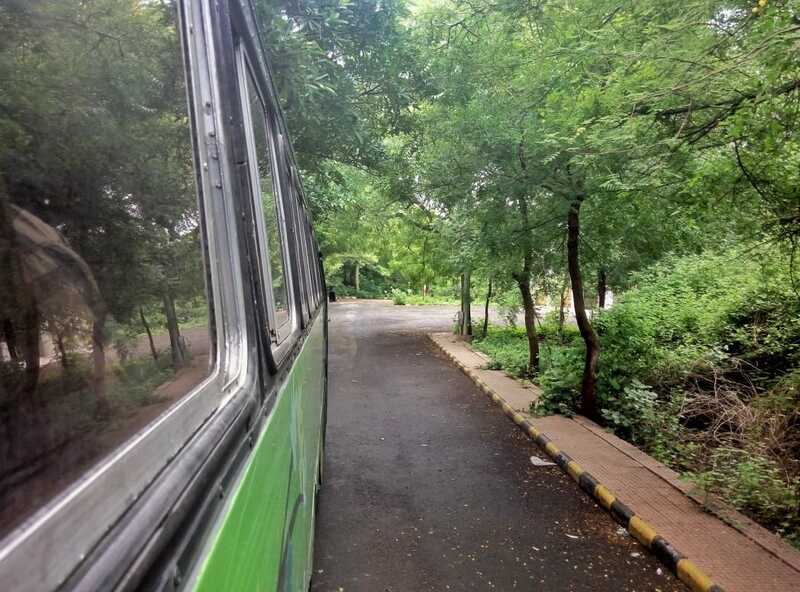 This might seem impossible – but the amazing, otherworldy beauty created and admired by many generations faded away from the memory of people. 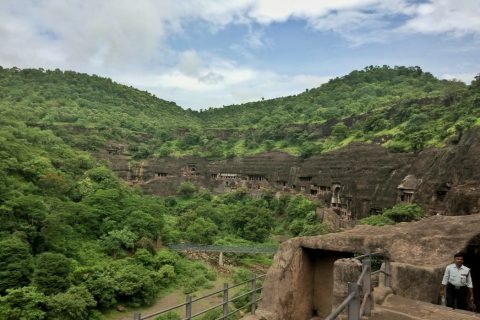 Once filled with life, beautiful caves were silent and undisturbed for approximately 1,100 – 1,300 years. Imagine… 1,300 years! Officer of British army, captain John Smith was hunting a tiger in April 28, 1819. 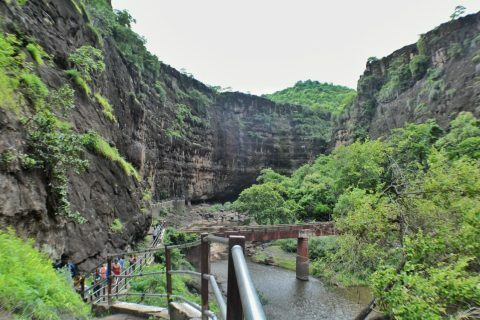 He followed the trail and entered the gorge. Back then the cliff walls were covered with dense vegetation – but captain noticed a hollow through the interlaced roots and shoots. Captain Smith left his name on the wall in this cave – this inscription still is faintly visible up to this day – out of reach now as the debris has been removed. 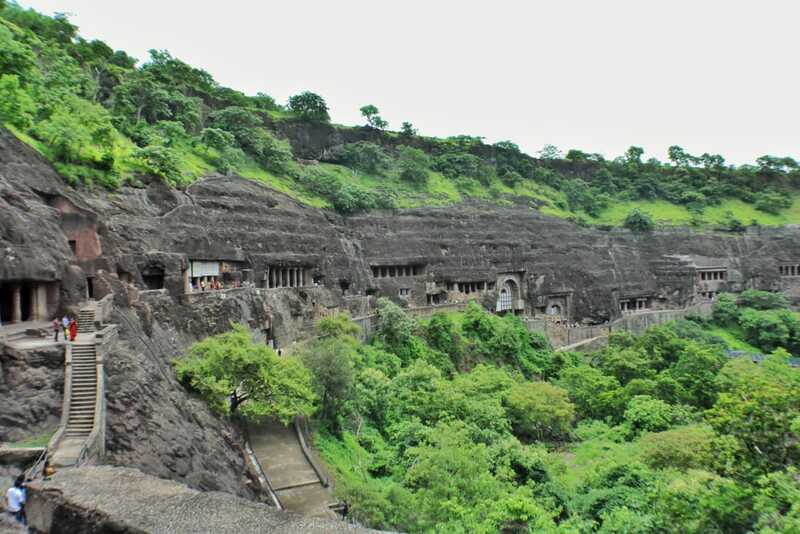 In total there are 29 – 30 cave chambers in Ajanta. 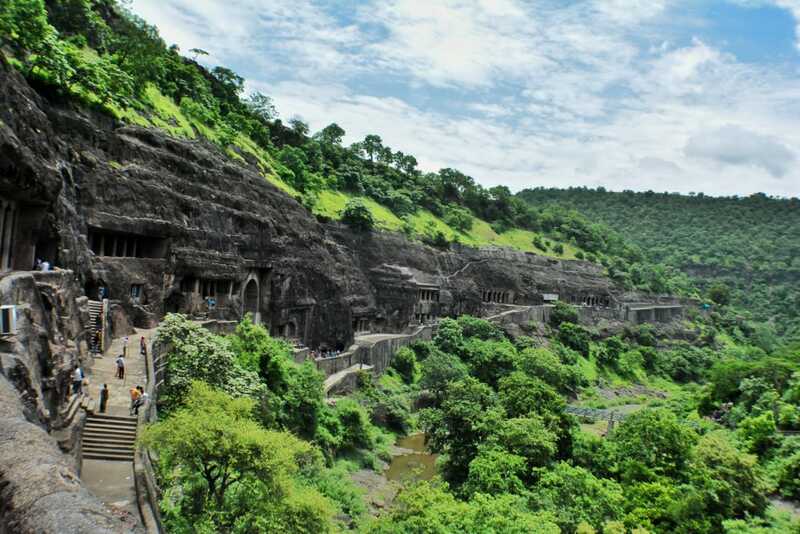 Caves traditionally are numbered starting with the one closest to the village. 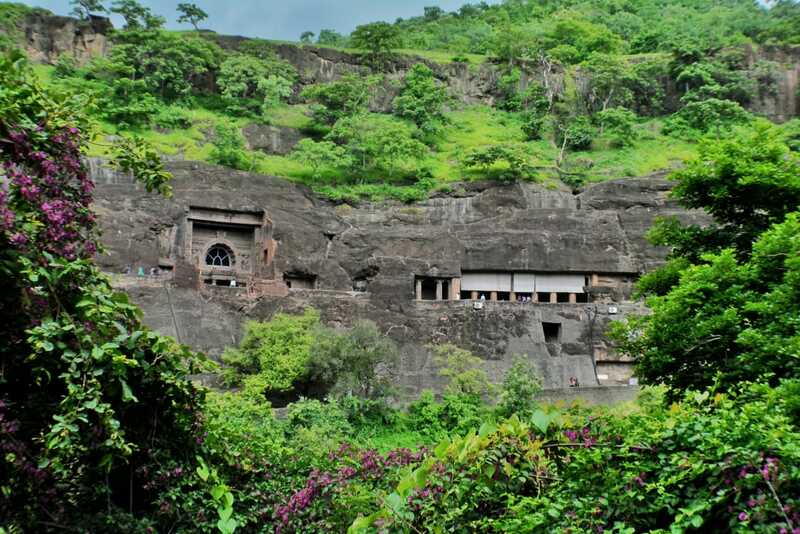 One of the best preserved cave chambers in group, considered to be the most splendid Buddhist vihara in India. 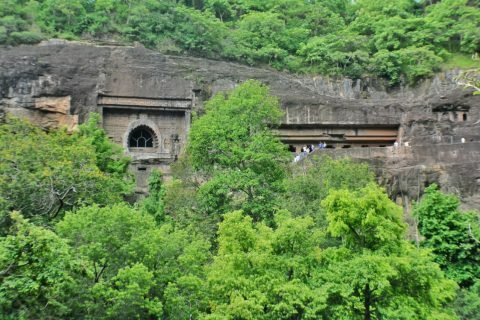 Possibly created to be a imperial cave of king Harishena. 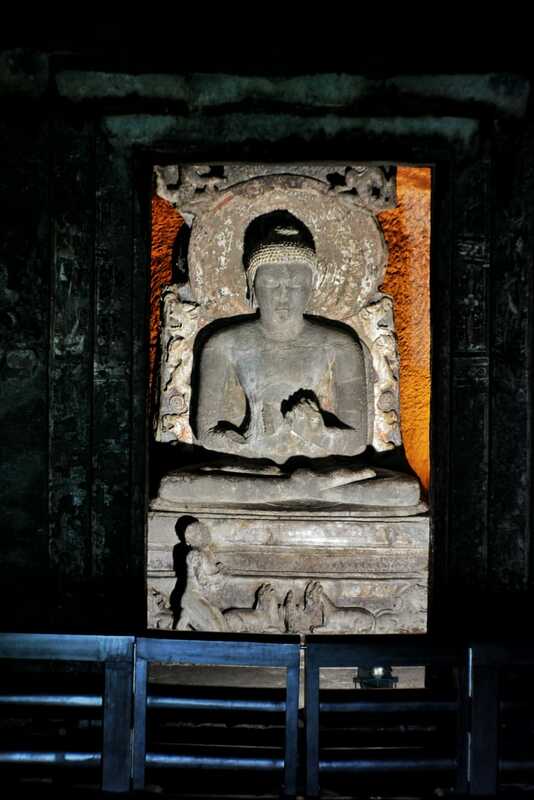 Paintings look fresh and are not damaged by sooth – thus it is possible that this cave was not used by monks. Some details though have perished such as portico with two pillars seen in photographs from the 19th century. 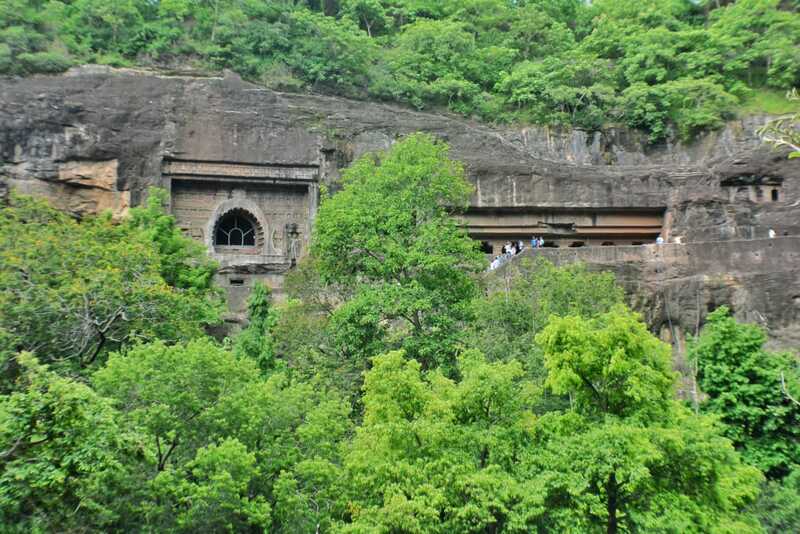 Cave can be entered through three doorways, two windows are located between doorways. The facade of cave is adorned with elaborate, exquisite carvings depicting scenes from life of Buddha. Porch still contains remnants of murals which once covered most of the spacious porch. 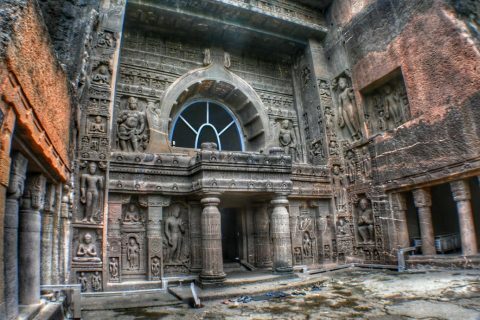 Main hall is some 6 m high with a shrine located at the rear wall. Shrine contains statues of seated Buddha. There are cells along the walls of the main hall. 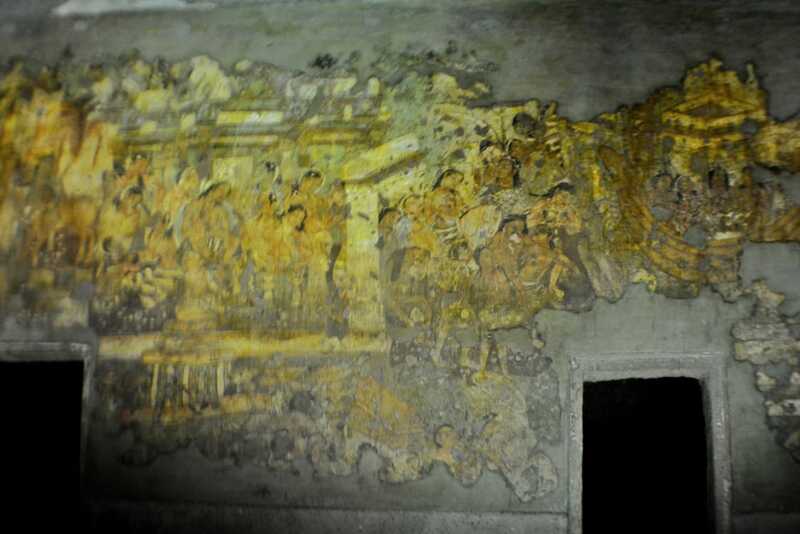 Paintings covering walls are in rather good state of conservation and belong to the best examples of ancient Indian art. This monastery building is even better preserved than Cave 1. 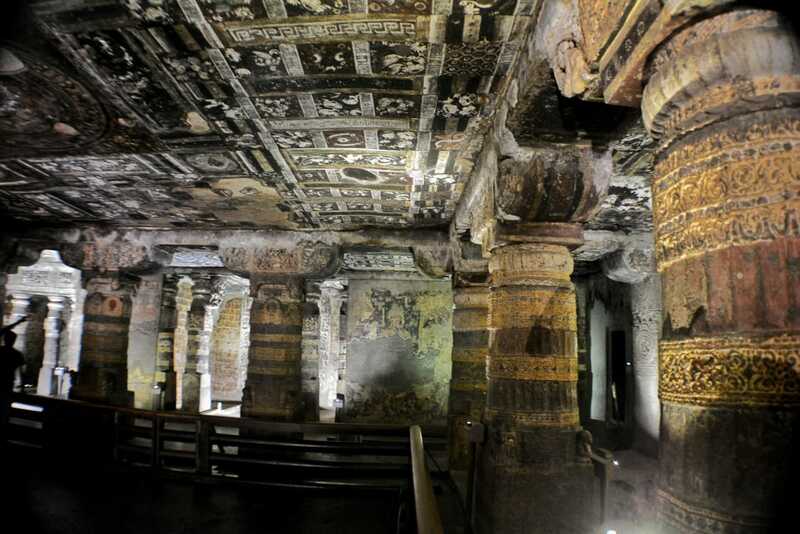 Contains exquisite, well preserved paintings on walls, ceilings and pillars. 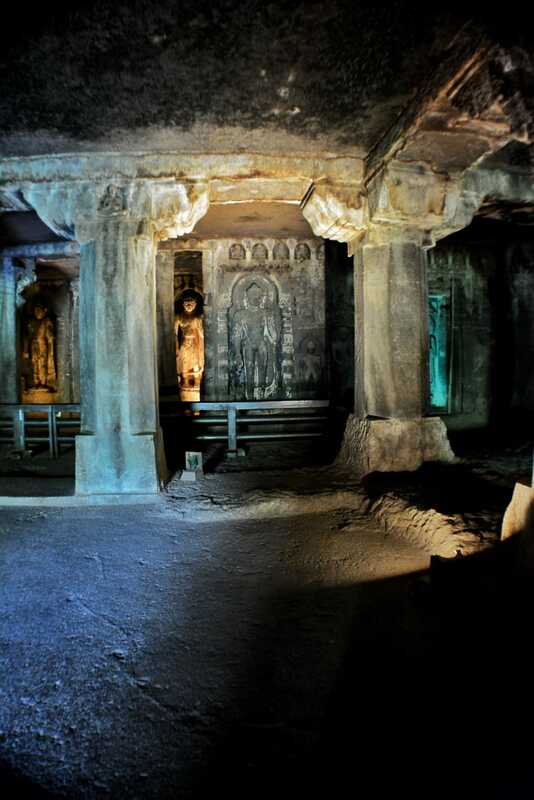 Design of porch differs from Cave 1, massive pillars are ornamented, walls covered with murals depicting the life of Buddha in his former incarnations as Bodhisattva. 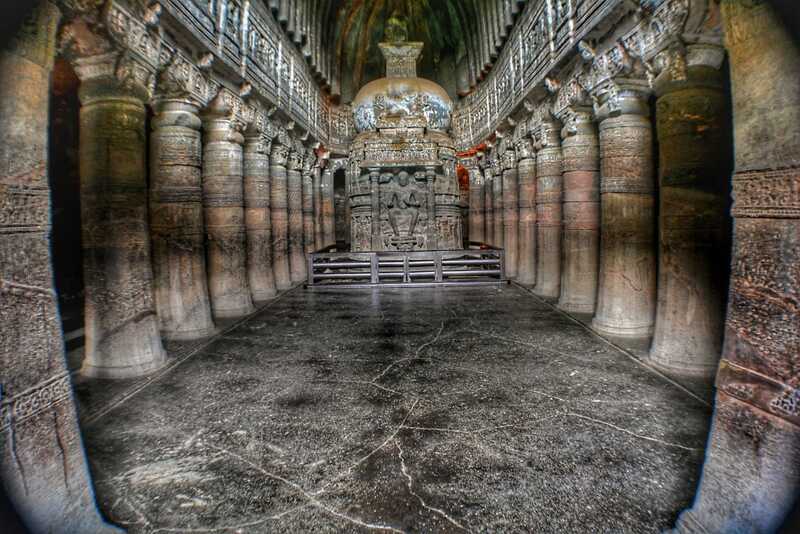 Contains also smaller shrines to lesser deities. 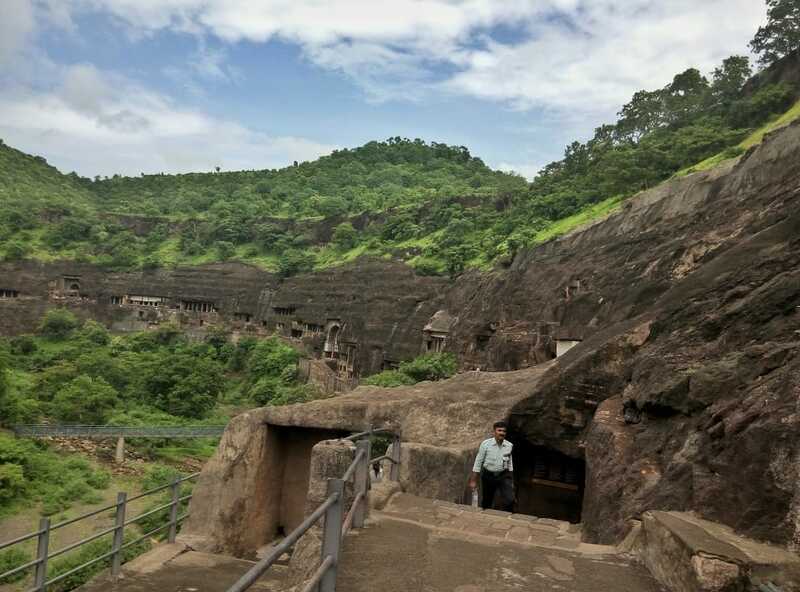 This cave in general is very rich with paintings – in some areas well preserved, in other – nearly lost. 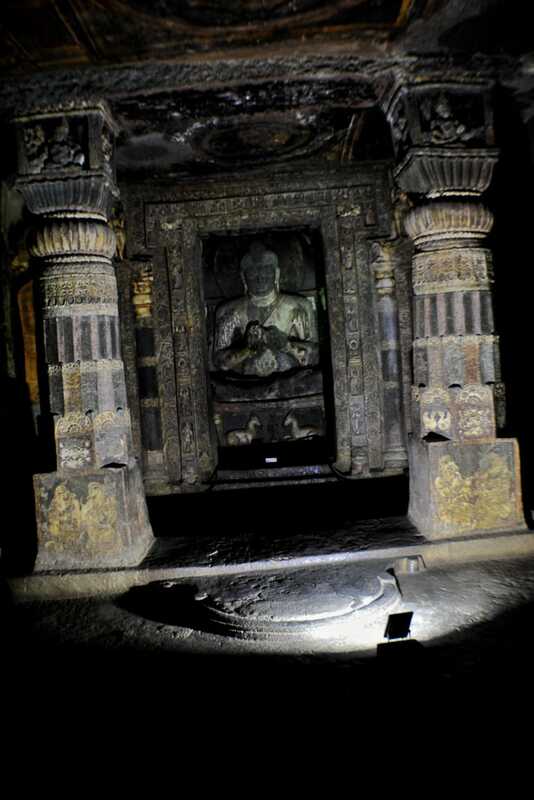 The largest vihara in Ajanta Caves, created in the 5th century. Partly collapsed, most likely during the construction. Inscription on the pedestal of Buddha in this vihara tells that the sculpture is a religious gift from private person. Never completed – basically only porch, door and short distance after the door have been made. 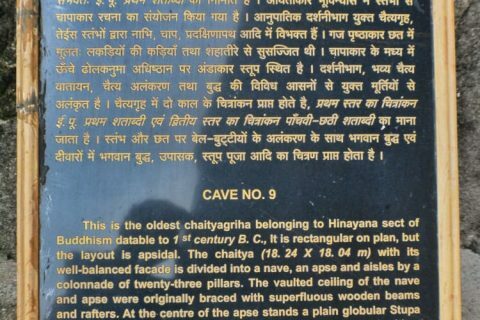 Still this cave contains beautiful sculptures. The only double-story structure in Ajanta Caves. 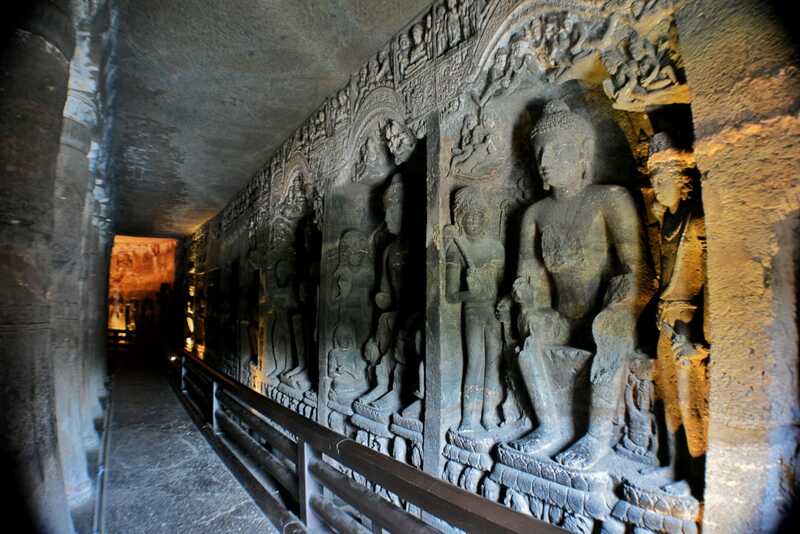 Walls of this cave are covered with thick layer of sooth from incense and lamps, damaging the exquisite artwork. 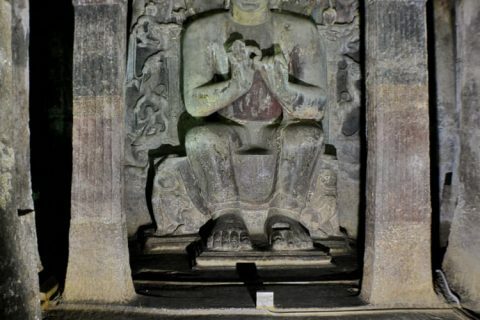 Diverse paintings include a figure of devotee kneeling before Buddha. Intented as an enormous vihara but not completed. Only very elaborate porch with few more details has been built. Exquisite paintings of the porch lost due to smoke. 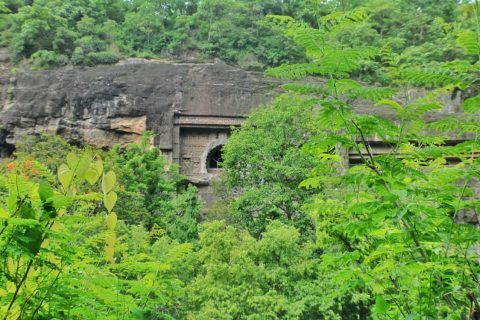 Ancient structure, belonging to Hinayana school, created in the 2nd – 1st century BC. Ancient structure, belonging to Hinayana school, created in the 2nd – 1st century BC. Contains ancient paintings which have been repainted at some later time. This is the cave which was discovered by Captain Smith in 1819 and it bears his inscription in pencil. The oldest (as far as archaeological knowledge about Ajanta goes) structure in Ajanta dating from the 2nd century BC, architecture testifies its belonging to Hinayana school. Contains ancient paintings which have been repainted at some later time. 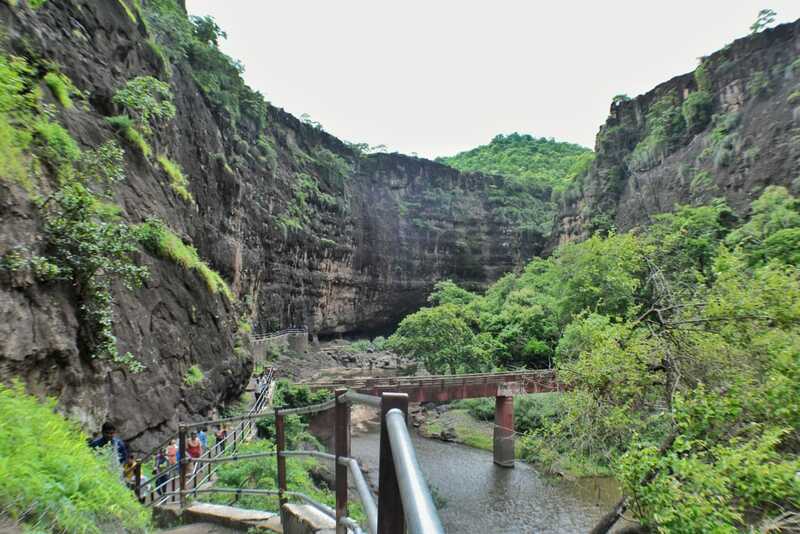 Possibly the oldest cave from the second period of Ajanta – from the 5th century. Made in the late 5th century, never completed. 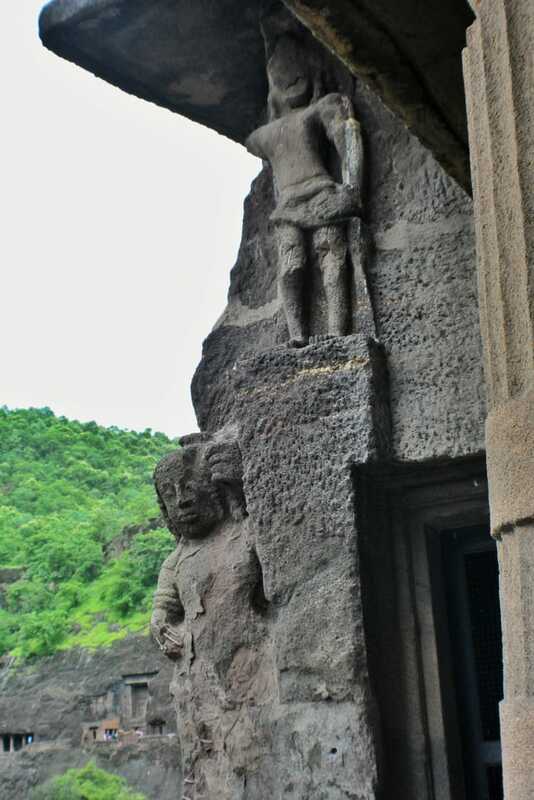 Basically there is made rough doorway with sculptures of yakshis. 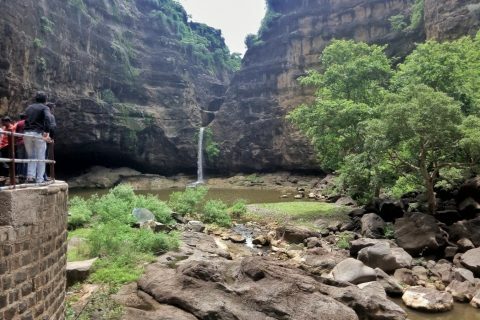 One of the best placed caves in the middle of complex. Cave chamber is adorned with beautiful paintings. Two elephant statues at the base of stairway leading to the cave. Porch is damaged. 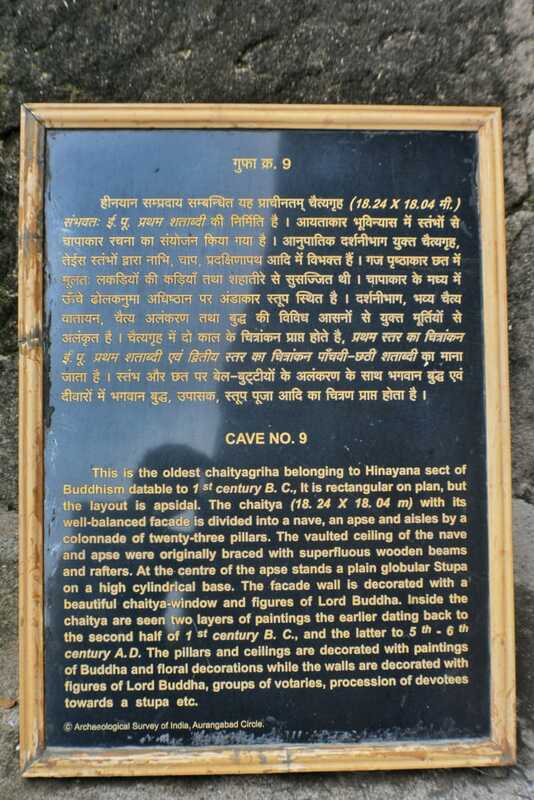 Inscription testifies that this cave is dedicated to the Buddhist Sangha by Vaharadeva, the influential prime minister of king Harishena (around 475-500 AD). 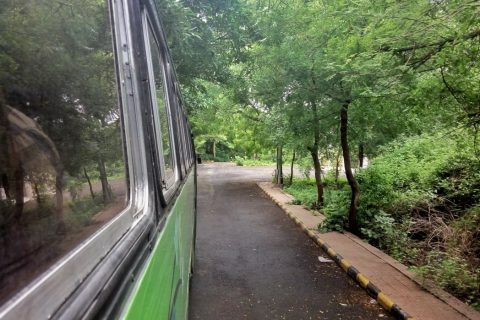 There are numerous important inscriptions rising scientific discussion about the history of Central India in 460 – 480 AD. The richest collection of beautiful murals (especially ceiling), though in many places damaged by sooth from incense and lamps. Interesting accent is depiction of ancient Persian – Sassanian servant holding a Sassanian vessel on the left rear wall. 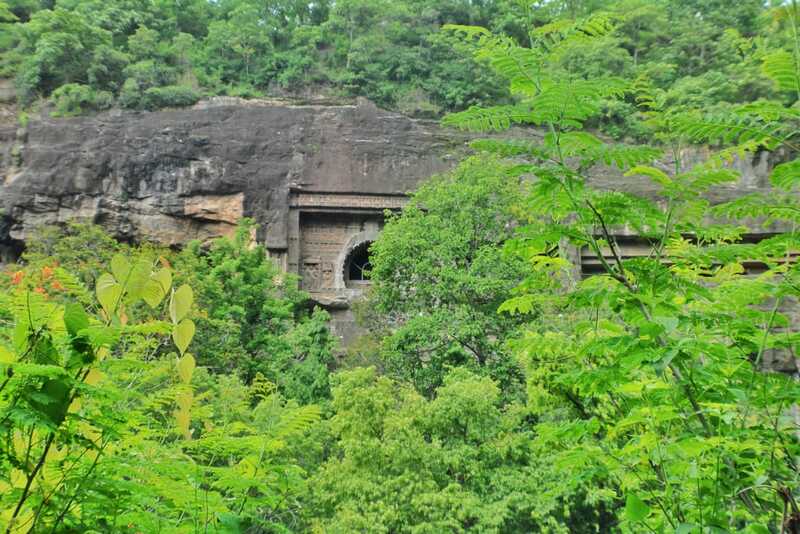 Inscription testifies that this structure is a gift of prince in time of king Harishena (around 475-500 AD). Initially – possible side shrine, part of Cave 19. Over the time though developed as a cut-through between Cave 17 and Cave 19. Magnificent chaytia from the late 5th century. 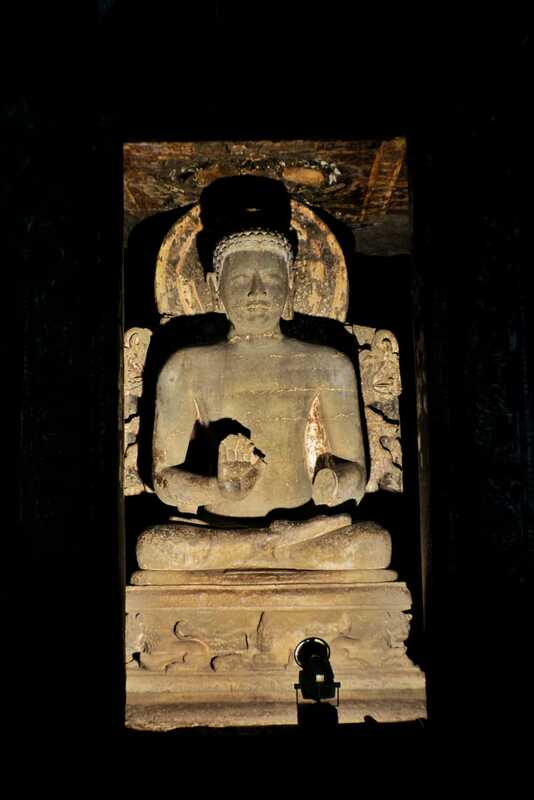 Contains remnants of paintings including depictions of Buddha considered to be innovative by some art historicians. Facade of porch is very rich with adonrments. Shrine from the 5th century AD. 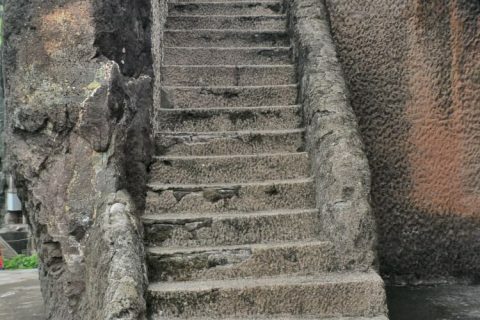 Contains impressive stairway while chamber has little of interest to offer. Cave contains murals – including depictions of mundane joys such as hunting. 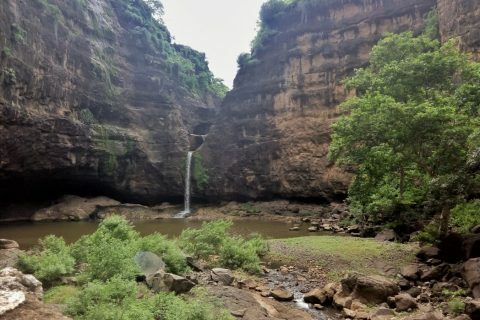 The first cave behind periodic waterfall. Vihara from the 5th century AD, unfinished. Porch is well adorned and preserved. Mostly unfinished, porch though contains interesting figures. 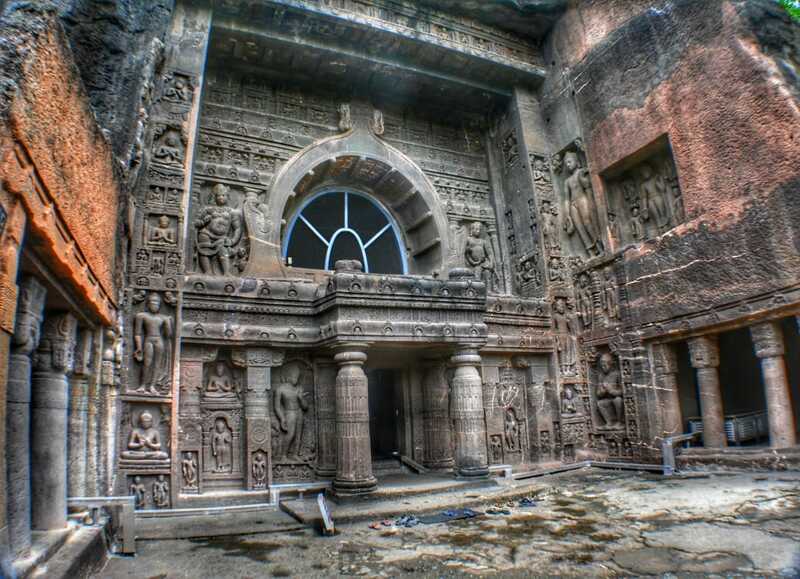 Mostly unfinished but doorway is beautifully carved. 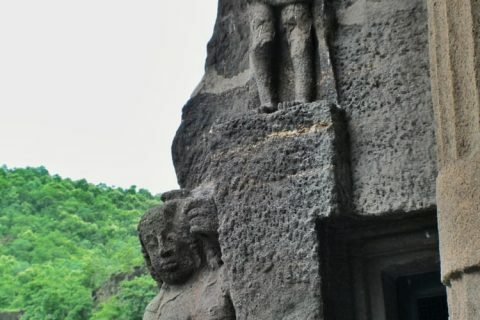 Sculptures of two river goddesses on upper corners of doorway. 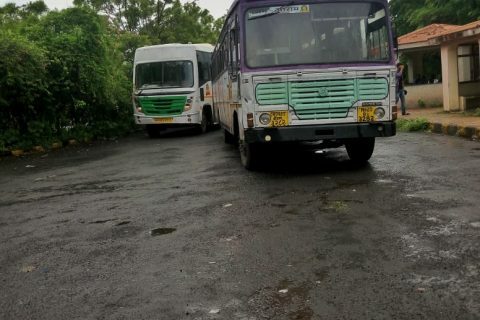 It is calculated that approximately 200 people were working here when works unexpectedly terminated. 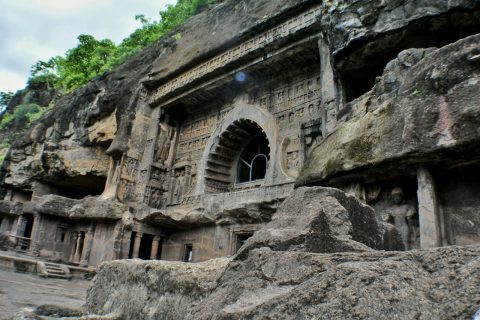 Created in the late 5th century, a group of structures. 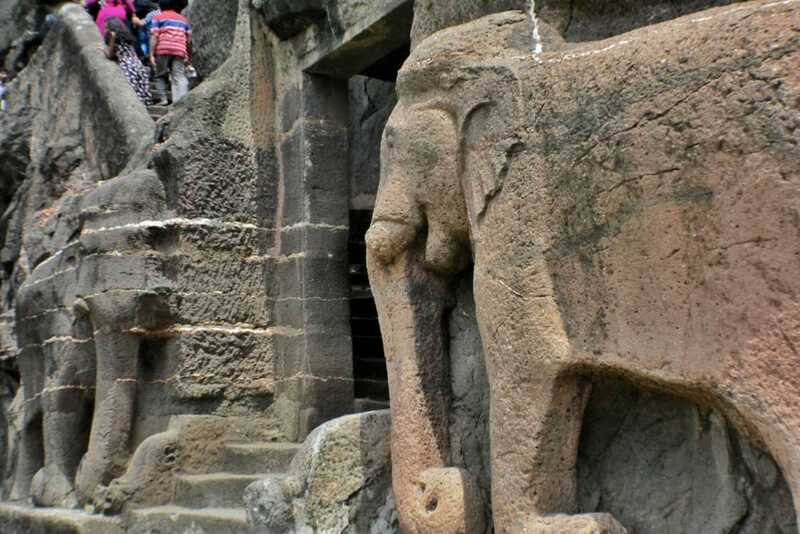 Contains interesting drawings resembling a style of drawings at Ellora Caves. Porch adorned with numerous statues of Buddha as well as numerous other subjects. 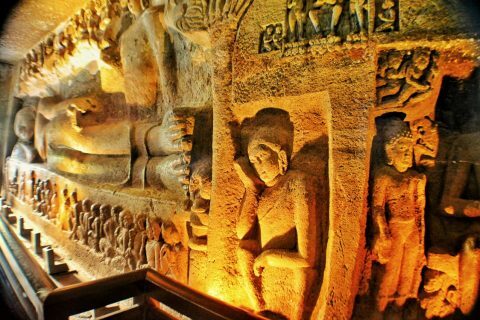 Famous sculptural group is Parinirvana scene along the whole length of cave. Painting on ceiling includes the usual lotus-lake motive, but here several geese are added among lotuses. 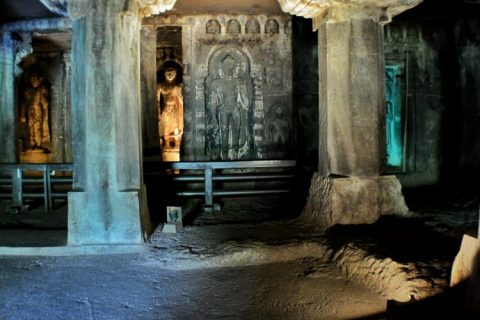 Contains paintings at the right end of the front aisle as well as inscription which informs that monk – painter here attained transcendental personage through painting images of Buddha. 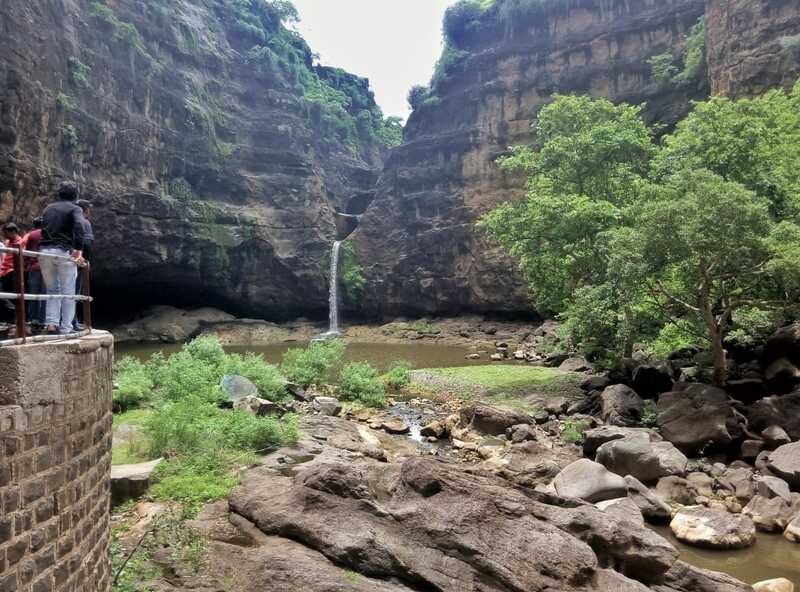 Here starts a fall of Vaghora River with seven cascades (sat-kund). Cave chamber is not finished, made in the 5th century. 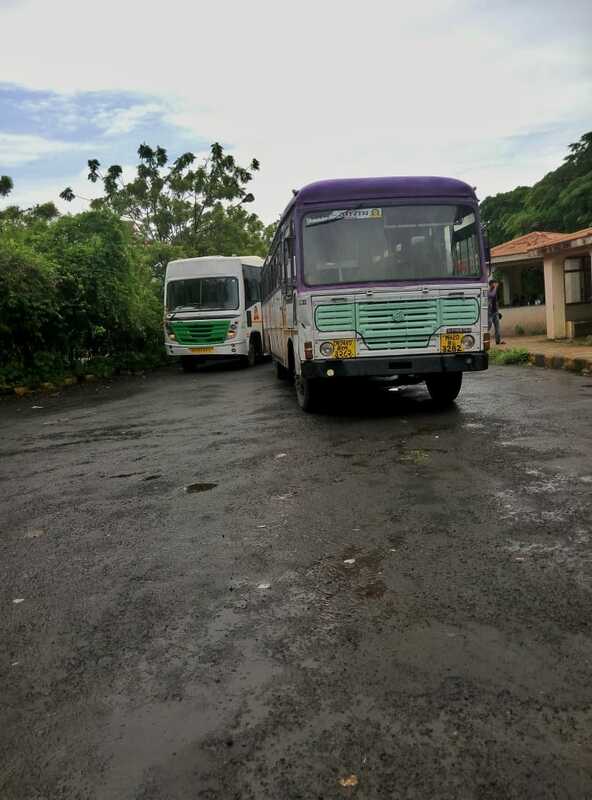 ഇനിയും തോൽവി അറിയിക്കാൻ ഈ വഴിയും ഇല്ല..